It is light weight and portable making it ideal for hunting, camping, fishing, boating or traveling. Spouse won’t let your beloved Shed Monster on the couch or bed? Has your fancy flooring rubbed hot spots onto your little buddy’s joints? Mom covering everything in plastic and doilies? Erase Rocky’s sad doggie face as he stares at you atop your stately throne and elevate your family fuzzball to royalty status! Coolaroo Pet Bed was made with Rocky in mind. 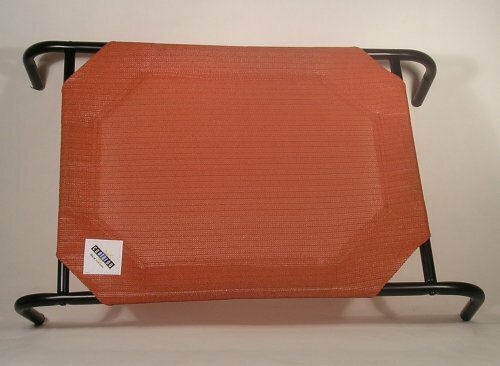 Water resistant rigid platform ensures proper spinal support for pooch. Turn Rocky’s frown upside down and order his premiere pet bed today! Only a Coolaroo pet bed features our unique commercial grade, knitted fabric specifically designed to breathe, resulting in a cooler place for your pest to chill. Beyond a reduction in temperatures, our fabric is made of recyclable material and endorsed by GreenGuard, the Melanoma International Foundation and Oeko-Tex. Ours is the story of a hard-working Australian family that turned a small hand-woven scarf business into one of the world’s most important manufacturers and marketers of Advanced Polymer textiles and value added products, the transformation of a small knitting mill into a multi-million dollar global enterprise with the introduction of the world’s first shadecloth knitting technology, the need based ingenuity of people adapting to extreme temperature fluctuations. Future fabric developments seek to reduce environmental footprints even further while continuing to provide homeowners with the value and quality they have come to expect…and deserve.